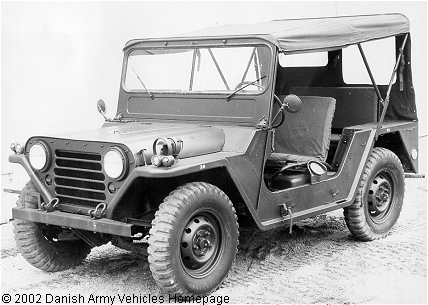 Danish Army Specific: Delivered to the Danish Army in 1967 the M151A1 was used as Liaison-, Scout-car and armed with TOW. First batch was 600 units. Another batch of approx. 120 vehicles were acquired second hand from the US Army in the early 1970´s. Along with the Willys M38A1, it superseded the Willys CJ2A, CJ3A and CJ3B. Now superseded by Mercedes GD 240. Historical: In 1950 the Continental Army Command placed a requirement with the Ordnance Corps for a new 1/4 ton vehicle. The vehicle was intended to replace the remaining WW II Jeeps vehicles in US military service. Research and development on the vehicle that was designed after a low-cost "throw away" principle began that year at the Ordnance Tank-Automotive Command. It was intended to offer maximum cross-country capabilities combined with high flotation, air-drop capability and easy of maintenance. In March 1951 Ford Motor Company was awarded a development contract for the new vehicle and the first prototypes were completed in 1952. Further prototypes were produced in 1954. Approved for production in summer 1959 with Ford being awarded a production contract in June 1959. Quantity production took place from March 1960 at Ford's Highland Park Plant, using steel bodies by Fruehauf. The production contract was lost to Willys in 1962. Willys was taken over by Kaiser Corporation in 1963, and the vehicles were renamed Kaiser-Jeep. The M151A1 was produced from 1964 and in 1965 Ford got the contract back. The A2-version was produced from 1970. AM General was awarded a contract in 1971, and they continued until production ceased in 1985. A small-scale production was set up in 1988 to supply vehicles to overseas costumers. At least 430.000 units (all types) were produced from 1960 to 1988. Introduced in more than 100 countries. Length: 3.37 m (131 inches). Width: 1.63 m (64 inches). Height: 1.80 m (71 inches). Weight: 1.610 kg (3.542 lb.). Engine: Ordnance/Continental 4-cylinder, type L-142, 2.319 cm3 (141.5 cubic inches) displacement, liquid cooled, carburettor. Horsepower: 71 hp at 3.900 rpm. without preparation: 0.53 m (21 inches). Fuel capacity: 65 liter (14 gallons). Additional: Besides its standard form the M151 was among others produced as ambulance (M718/M718A1), platform for the 106 mm recoilless rifle (M151A1C/M825) and platform for TOW launcher. Also used as a platform for Fast Attack Vehicle by the Marine Corps and US Army Rangers.